You can thank the Apis Mellifera, better known as the Western honeybee, for 1 in every 3 mouthfuls of food you'll eat today. From the almond orchards of central California--where each spring billions of honeybees from across the U.S. arrive to pollinate a multibillion-dollar crop--to the blueberry bogs of Maine, the bees are the unsung, unpaid laborers of the American agricultural system, adding more than $15 billion in value to farming each year. In June, a Whole Foods store in Rhode Island, as part of a campaign to highlight the importance of honeybees, temporarily removed from its produce section all the food that depended on pollinators. Of 453 items, 237 vanished, including apples, lemons and zucchini and other squashes. Honeybees "are the glue that holds our agricultural system together," wrote journalist Hannah Nordhaus in her 2011 book, The Beekeeper's Lament. And now that glue is failing. Around 2006, commercial beekeepers began noticing something disturbing: their honeybees were disappearing. Beekeepers would open their hives and find them full of honeycomb, wax, even honey--but devoid of actual bees. As reports from worried beekeepers rolled in, scientists coined an appropriately apocalyptic term for the mystery malady: colony-collapse disorder (CCD). Suddenly beekeepers found themselves in the media spotlight, the public captivated by the horror-movie mystery of CCD. Seven years later, honeybees are still dying on a scale rarely seen before, and the reasons remain mysterious. One-third of U.S. honeybee colonies died or disappeared during the past winter, a 42% increase over the year before and well above the 10% to 15% losses beekeepers used to experience in normal winters. Though beekeepers can replenish dead hives over time, the high rates of colony loss are putting intense pressure on the industry and on agriculture. There were just barely enough viable honeybees in the U.S. to service this spring's vital almond pollination in California, putting a product worth nearly $4 billion at risk. Almonds are a big deal--they're the Golden State's most valuable agricultural export, worth more than twice as much as its iconic wine grapes. And almonds, totally dependent on honeybees, are a bellwether of the larger problem. For fruits and vegetables as diverse as cantaloupes, cranberries and cucumbers, pollination can be a farmer's only chance to increase maximum yield. 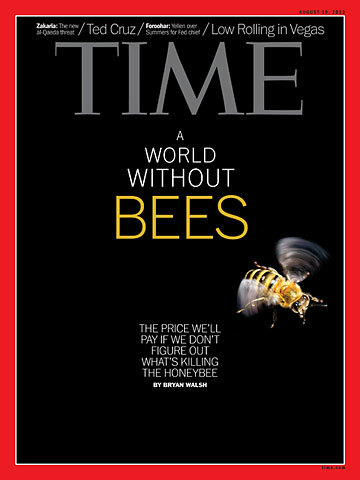 Eliminate the honeybee and agriculture would be permanently diminished. "The take-home message is that we are very close to the edge," says Jeff Pettis, the research leader at the U.S. Department of Agriculture's Bee Research Laboratory. "It's a roll of the dice now."